I thought a rice cooker was only for rice – who knew you could also make risotto, oatmeal, even cheesecake in it! I love risotto, but I just don’t have the time to stand over the stove stirring the rice all night! And, the steaming basket for vegetables makes this a multitasking dream. 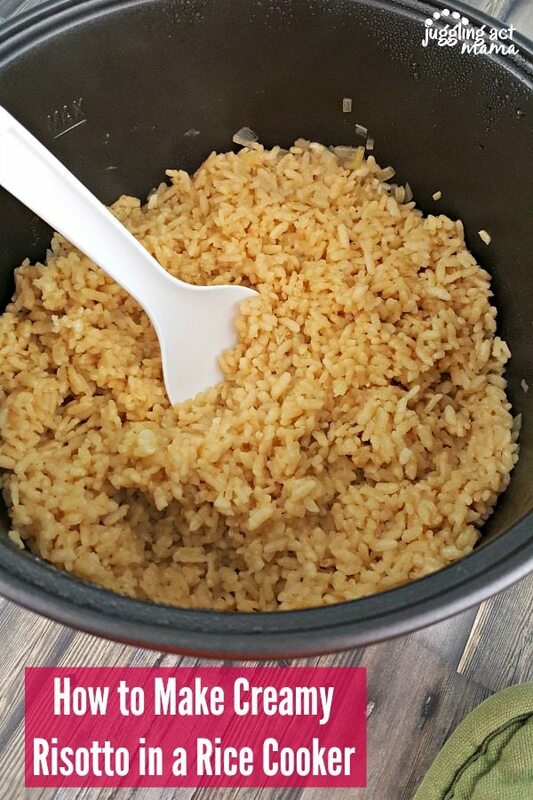 Using the Hamilton Beach Stainless Steel Rice & Hot Cereal Cooker to make this quick risotto saved me a ton of time, and really wowed my husband. He couldn’t believe I’d been able to make risotto on a weeknight. 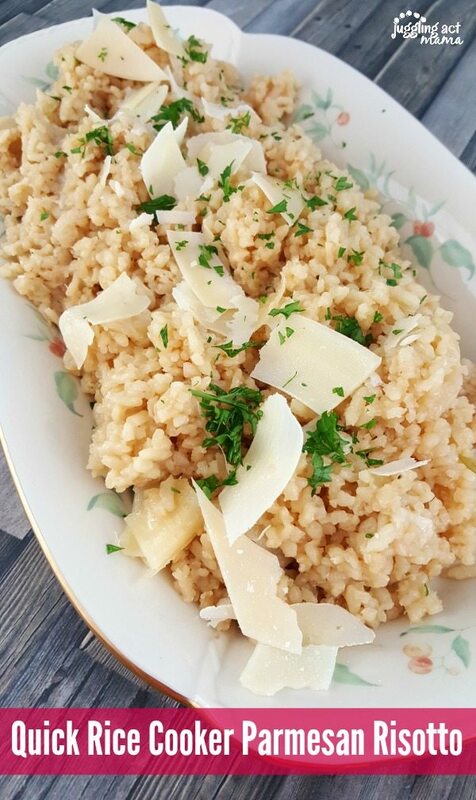 In all honesty, this Quick Rice Cooker Parmesan Risottois just as delicious and creamy as if I’d stood over it for an hour ladling in stock, but I was able to play a game with the kids while it cooked itself in the rice cooker! 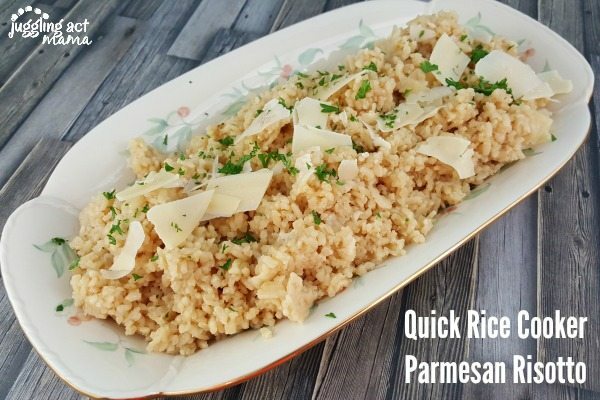 This Quick Rice Cooker Parmesan Risotto will soon become your favorite recipe! Serve it with my Port Wine Braised Sirloin for a truly decadent meal. Melt the butter in a skillet over medium heat. Add the shallot and garlic and cook until tender. (It will seem like a lot of butter, until you add the rice). Add the rice and cook 5 minutes to coat all the rice with the butter. Transfer the mixture to the rice cooker pot. Add the stock, salt, pepper and stir to combine. Close the rice cooker and select the QUICK RICE setting, which will cook for 35 minutes. When the rice cooker switches to warm, add butter, half and half and Parmesan and stir to combine. Garnish with additional Parmesan and parsley, if desired. **This post contains Amazon Affiliate links. All opinions are my own, but I only promote things that I love and think you will love, too! This does not increase the cost to you, but does help support Juggling Act Mama. For more information, please see our Disclosure Policy. 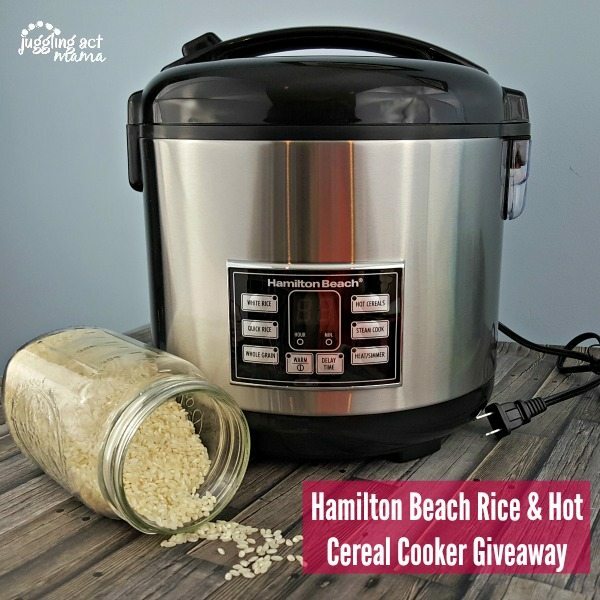 Hamilton Beach is giving away one 4-20 Cup Rice Cooker and Hot Cereal Maker. Please carefully read all terms and conditions: Open US only. One (1) winner will be chosen and contacted via email. Prize must be claimed within 48 hours of announcement or a new winner will be drawn. All entries will be verified. This giveaway is in no way associated with Facebook, Pinterest, Twitter, Instagram, Rafflecopter, or any other entity unless otherwise specified. No purchase necessary. Juggling Act Mama not responsible for delivery of prize. Hamilton Beach is unable to ship to P.O. Boxes. Your photos are really good! You do a nice job putting your information together. I never thought of getting a rice cooker until now. Thanks! This is just what I need! It sure would make life simpler. Yes! I can’t wait to try it to make overnight oats!